The Great Synagogue of Warsaw was one of the greatest buildings built in Poland in the 19th century and at the time of its opening was the largest synagogue in the world. It was located on Tłomackie street in Warsaw. The synagogue served the acculturated elite of Warsaw's Jewry, and like other such prayer houses in Eastern Europe it was conducted in a relatively modernized fashion though it did not approach ideological religious reform. Sermons were delivered in Polish rather than Yiddish, an all-male choir accompanied the service and there was even an organ, which played only on weddings. Liturgy and other principled issues remained wholly untouched. Opened on 26 September 1878 in the celebration of Rosh Hashanah (Jewish New Year), it was personally blown up by SS-Gruppenführer Jürgen Stroop on 16 May 1943, which was the last act of destruction of the Jewish ghetto in Warsaw by the Germans. The Great Synagogue was built by the Warsaw's Jewish community between 1875 and 1878 at Tłomackie street, in the south-eastern tip of the district in which the Jews were allowed to settle by the Russian Imperial authorities. The main architect was Leandro Marconi. After the Warsaw Ghetto Uprising, on May 16, 1943 the SS blew up the building. It was not rebuilt after the war. What a marvelous sight it was. A fantastic piece of theater. My staff and I stood at a distance. I held the electrical device which would detonate all the charges simultaneously. Jesuiter called for silence. I glanced over at my brave officers and men, tired and dirty, silhouetted against the glow of the burning buildings. After prolonging the suspense for a moment, I shouted: 'Heil Hitler' and pressed the button. With a thunderous, deafening bang and a rainbow burst of colors, the fiery explosion soared toward the clouds, an unforgettable tribute to our triumph over the Jews. The Warsaw Ghetto was no more. The will of Adolf Hitler and Heinrich Himmler had been done. 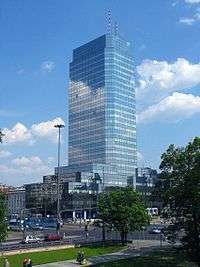 Since the 1980s, the site has been occupied by a large skyscraper, once known as the Golden Skyscraper and currently commonly referred to as the Blue Skyscraper (Polish: Błękitny Wieżowiec). ↑ Polin: Studies in Polish Jewry, Vol. 21, p. 427. "Services in the synagogue were slightly Reform-oriented, to the extent that the Orthodox tradition allowed." ↑ Kazimierz Moczarski (1981), Conversations with an Executioner, page 164. Wikimedia Commons has media related to Great Synagogue in Warsaw.